Phantom Gourmet's BBQ Beach Party! 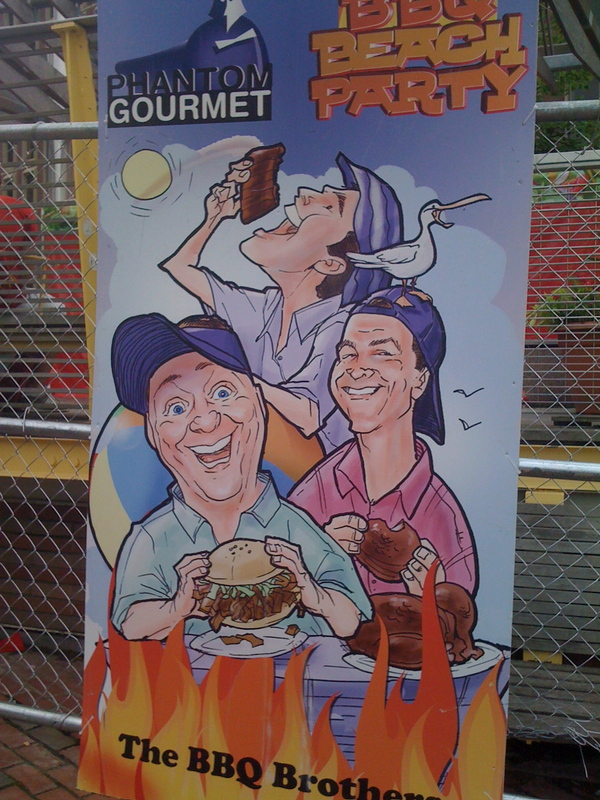 A couple weeks ago, I had the pleasure of attending the annual Phantom Gourmet BBQ Beach party. Who is the Phantom Gourmet and why is he holding such a tasty party? The Phantom Gourmet is a local TV and radio show out of Boston, where a secret team of reviewers judge restaurants around the New England area and three hosts report on how the latest culinary cuisines stack up. The BBQ Beach Party is one of several local events the show holds where top BBQ contenders are asked to showcase their finest ribs, brisket and pulled pork for the city. Of course, there is also live music, beer/wine and appearances from the Phantom Gourmet hosts. Since I’m from the South and am a BBQ lover (yes, the stereotype is correct on that one), the event had been recommended to me since I moved last year. The seven featured BBQ joints were all winners of a slew of national prizes and represented various areas of the country. Of course, nothing will beat Saltlick in Driftwood, Texas for me but it doesn’t hurt to get some good BBQ now and again. Out of the seven stations, I was able to sample ribs from five stands. Honestly, my favorite was Jack’s Down Home BBQ out of Philadelphia, PA. It had the best cooked ribs of the five both in flavor and texture. The best bang for the buck was Johnson’s BBQ out of Chesapeake, VA. They had the most meat on the ribs, which were HUGE! I was probably most disappointed in Big Show BBQ out of Kansas City. I will however say that these ribs were probably cooked the most traditional, as they were the only ones where the meat was so tender that it fell off the bone. However, taste-wise, they didn’t really do it for me. The Texas Thunder BBQ stand was also good but not great. I hold Texas BBQ in high regard – so I probably judged it fairly harshly though it just wasn’t the best of the lot. All in all, it was a delicious event and I left with what I like to refer to as the “meat sweats.” I thought all of the BBQ was good and I would definitely attend again next year. It was also nice to have a little taste of home right in my own backyard. This entry was posted on Friday, July 8th, 2011 at 12:39 am	and tagged with BBQ, Beach Party, Boston, Phantom Gourmet, Ribs, Saltlick and posted in Activity. You can follow any responses to this entry through the RSS 2.0 feed.